In light of the issues outlined in the earlier sections of this guide a parole Board may decide that a careful review of the potential for development of parole guidelines is warranted. If that is the case, it is recommended that a Board consider the following five-step process as a way of moving forward. Undertaking this process, as a team, will encourage the development of a shared understanding of the Board's current thinking regarding decisionmaking, and help the Board to revisit shared goals and values, and to consider whether they want to move forward to develop decision guidelines and put in place policies about the use of decisionmaking tools. The remainder of this section moves through these steps to assist parole Boards in exploring and enhancing their current understanding of the research, in exploring their own Board's existing policy/practice, in assessing whether opportunities for change exist, and in planning for desired change. Regardless of whether Boards are engaging this process as a full body, subcommittee, or working group, it will be important to move through this process as a team. A team-based approach provides a strong basis for developing a clear, shared understanding of the current situation in which to examine what changes will strengthen their practice. 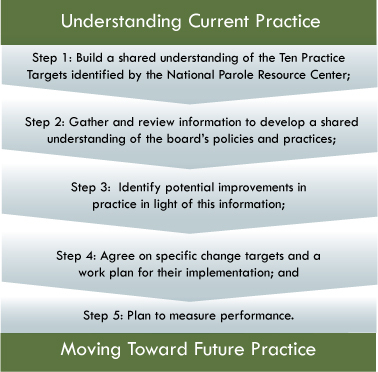 The remainder of this section moves through these steps to assist Parole Boards – working as a team – in exploring the existing state of collaboration, assessing whether opportunities for change exist, and planning for desired changes.